We allow vacation home owners and property managers the ability to create gorgeous website listings in less than 5 minutes. Almost all vacation listing sites have an outdated feel to them and are extremely pricey. 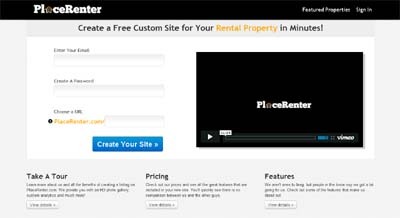 PlaceRenter breaks this mold by using cutting edge web technologies to make beautiful listings along with marketing tools to help them get more business. Along with these tools, we also provide real-time Analytics on every one of our listings, so that our users can evaluate their marketing ROI.